SoCalGas cited expectations of warmer-than-normal summer temperatures driving increased electricity demand as one of the factors raising potential energy reliability concerns. The ability to draw natural gas from storage fields in the SoCalGas system continues to be affected by operating restrictions on SoCalGas's Aliso Canyon field, an underground natural gas storage facility with a capacity of 86 billion cubic feet (Bcf), or 64% of SoCalGas's total storage capacity. This facility is still recovering from the leak that was initially detected in late October 2015 and plugged in February 2016. 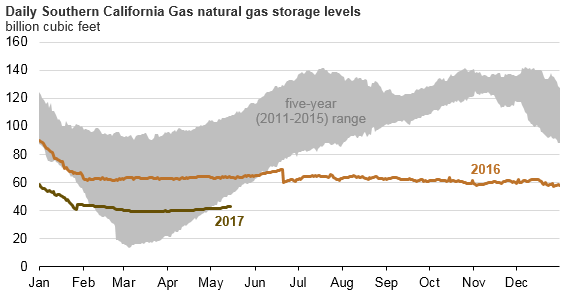 Following the leak, Aliso Canyon natural gas storage levels were reduced to about 15 Bcf, and total combined inventories at all of SoCalGas's storage facilities remained about 60 Bcf throughout most of 2016. In June 2016, the California Public Utility Commission (CPUC) conditionally authorized SoCalGas to withdraw the remaining 15 Bcf at Aliso Canyon. Storage injections into that field would require additional regulatory approval. 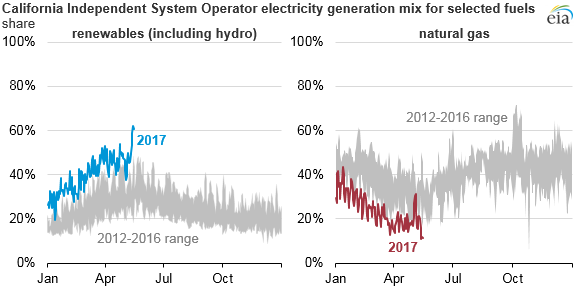 A total of 19 Bcf was withdrawn from the SoCalGas system from November 2016 through the end of March 2017, including withdrawals from Aliso Canyon during a two-day cold snap in late January. Over the five prior November-through-March periods, withdrawals averaged nearly 60 Bcf, ranging from 31 Bcf to 103 Bcf. As of May 16, SoCalGas's inventory stands at 43 Bcf.